GameDay helps your body recover quicker. Utilizing the Game Day Laser after the work-out or competition may allow you speed up the recovery, reduce muscle fatigue and gain the strength and stamina to get to the next training quicker. Treat any performance induced issues (pain, spasm, stiffness) with Setting 3. Use palpation of affected muscle groups and use trigger point probes if you have them. The same probes that attach to the MR4 Laser are compatible with the GameDay. Recovery and Training can obviously overlap so part of the preparation stage can be a continuation of the recovery phase. Treat pain first if it inhibits exercise, second if you are treating the cause of the pain first. If using multiple modalities, use ice before laser. 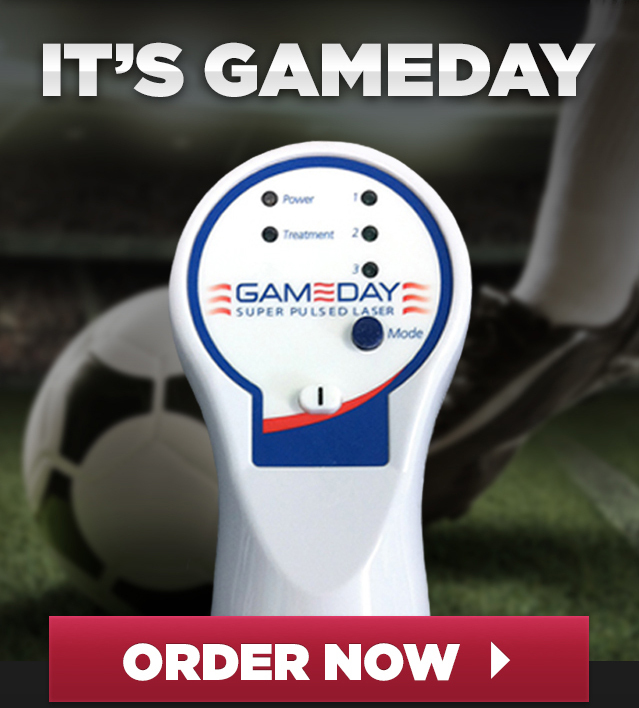 Since the GameDay is portable, it is perfect for on the plane, in the gym or wherever you need to use the GameDay to assist in your recovery. Most treatments last only 5 minutes, but can be repeated every 4 hours as needed for pain relief. Your trainer, or one of our Professional ATC staff members can assist with the best GameDay treatment plan for your specific recovery needs. Pain is your body’s way of telling you something is wrong. Just masking the pain with the GameDay may not be enough to get you ready for your next training cycle. Always check with your trainer or one of our Certified Athletic Trainer staff members to give you a GameDay plan to meet your recovery needs. If there are no significant recovery needs, rest and start the preparation phase. Your body may not be as conditioned as an athlete in season. A busy lifestyle may keep you fit, but on GameDay you may be relying on muscle groups that are exercised as often as they used to be. Use Settng 3 to treat normal soreness, aches and pains you feel the next day (s) after competition. The Laser Puncture probe attachments help focus laser energy and are particularly useful for muscle spasms.